How they met - Adam sat down to lunch one day in Dickinson Dining Hall at the table that Rachel's ex-boyfriend, his roommate, and she were eating lunch. Rachel was having a bad day, and when the conversation turned "ugly" she thought he was a jerk! Funny how he caused an argument between Rachel and her ex! 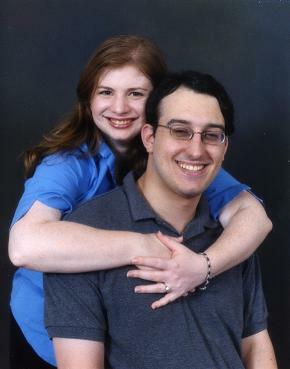 Rachel moved the following semester, and her roommate knew Adam, so they began talking again. Their friendship slowly grew, and (a great bit is omitted here for space) they eventually started dating, thanks to the efforts of Shirley, Howie, and Ellie! The Proposal, August 30, 2003 -They were in Binghamton visiting friends for Labor Day weekend, and Adam suggested that Saturday that they go over to campus for lunch. Rachel thought, Great, it's welcome back weekend and we can hit UniversityFest! So as they get to campus, Rachel is running into all these people, stopping to say hi to them. Adam is getting noticeably agitated - he's hungry, he says. Rachel is thinking, it's just the DINING HALL! What's the big deal? But they finally get over to the Dining Hall, and just as Rachel is saying We're here, she turns around and he's on his knee, in the place where they met almost 5 years prior.